Welcome! I’m so glad you’re here to learn how to arm knit. I think you’re going to love it! You don’t need to be a knitter at all, though if you are, it will be familiar right away. If you aren’t, I’ve provided lots of detailed photographs to make it super easy to follow and learn. You’ve reached Part 1: Casting On of a four part arm knitting tutorial. Or, if you want to skip to the end and/or have a portable copy, you can purchase the instant download PDF of all instructions here. Or, if you want a kit with gorgeous yarn and directions, go here! These yarns can be found at national chains such as Joann’s, Michael’s and Walmart. These yarns can be found online or at your local yarn shop. 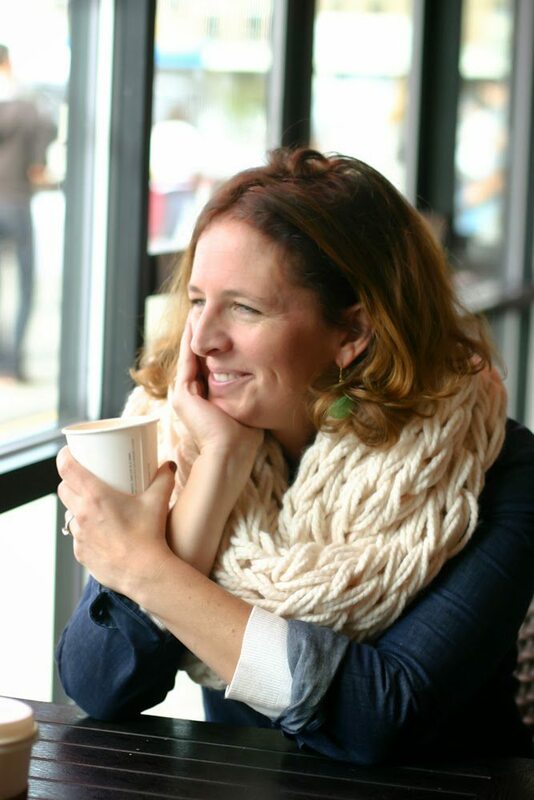 What I love about arm knitting is that you can come away from your first learning experience with a gorgeous cowl! What could be better? 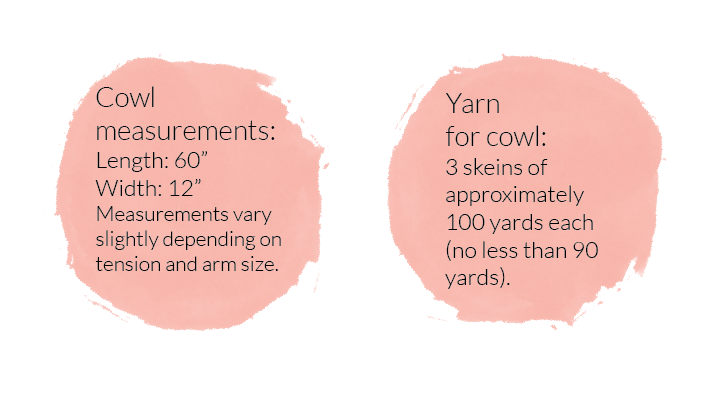 Here are yarn requirements and measurements for the cowl before we get started. // You will be working from 3 skeins of bulky yarn at the same time. Place all the ends together and treat it as if it were one strand of thick yarn. Before you start, make sure your yarn can unfurl from your skeins easily. // About 1.5 yards from the end of the yarn, make a loop by taking the working yarn over the tail. // Pull the working yarn through the loop. // Pull this tight to finish the slip knot. // Place the slip knot on your right hand with the tail closer to you and the working yarn farther from you. // Make a loop with the tail, so that the remainder of the tail hangs in front of the loop. // Hold the top of the loop with your right hand. Put your left hand through the loop and grab the working yarn. // Pull it through the loop. Drop the yarn you held with your right hand. // Put your new loop over your right hand. // Pull the working yarn and tail apart to tighten the stitch on your arm. // Repeat this process for as many stitches as you’d like. If you want to make the cowl, cast on 10 stitches. I’ll keep posting through the weekend, so go buy your yarn and you’ll have a cozy cowl by Sunday night! Oooh, another excuse to buy yarn! Can’t wait to try this. Thanks Betz! the rest is coming soon! Have just signed up for your blog via email. I have to say that I don’t think I’ve ever seen more clear, concise and easy-to-follow tutorials. I really like the pompoms-in-bulk. Like you, I try to find easy (lazy?) ways around everyday, monotonous things. For me, I would have turned the bench up-side-down and wound around all four legs. More poms at one time but more winding to get the thickness needed. Hmmmm, need to think about that! And wouldn’t it be great if more-reasonably-priced yarn still came in skeins that you could just un-twist and ta-da there was your almost-sausage. Maybe not so many poms at once but the thickness needed would sure be there! Hmmmm, need to think about that as well! Need to combine the two options somehow. Of course, when skeins were still around we would borrow a human who (whom?) could be bribed to hold up their arms forever in order to wind the skein into a ball. Remember doing this for my Mom (without the bribes); the rhythm we would get going was mezmerizing. Can’t wait to see what comes next and can’t wait to continue wandering my way through the rest of your blog. Thanks so much for your kind words. I agree on the bulk pompoms – that was silly of me not to think to turn the bench upside down. And yes! taking a skein that comes unbound would be an easy way to do it – voila, no twisting! Have fun exploring!! I’m so glad you are here. When I make this I’ll make it as a scarf. Don’t know where you live but I live in SW Ontario in Canada and the winter winds are quite nasty. Cowls look nice but don’t really keep out the wind. As the knitting in this is so loose I would be able to wrap the scarf around and around my neck to fill in the space between me and my coat. You make the cowl long enough to wrap around twice. You will not believe how warm it is. There is something about how the air pockets in the stitches that makes it insulating and plushy at the same time. It feels light and airy but keeps you super super warm. Just try it! 🙂 Let me know how it works!! Thanks so much, Amit! Give it a whirl! I agree! A step by step photo tutorial can be much easier than a video. Perfect for a brand new beginner! Thank you for this tutorial! I have a question however. It seems that my stitches weren’t as tight as yours look? It made it confusing to bind at the end. Do you have any tips? Hi Sarah, It is typical to have your stitches looser when you are first learning. As you get used to the action though, you should work on making the stitches tighter. If you have tighter tension, it will look less stringy and loose. To do this, when you are about to do a new stitch, grab the working yarn close to your arm so the stitch you just made doesn’t have a chance to loosen to much in the making. You can also tighten it (and the last few stitches) down on your arm right after you knit the latest stitch. The new stitches on your arm that your making should be fairly tight to your arm. Thanks for taking the time to ask! Perfect. I just made one and love it but the stitches were a little looser than I wanted. When I knit with needless I have a tenancy to work too tightly and didn’t want to make the same mistake with this but it seems that is not an issue. Also, I looked at a few arm knitting tutorials before finding yours. Yours is the best by far. Thank you sooooo much for sharing. What! Awesomeness! I never figured out the knitting thing either, so this not only looks easier, but way more fun. Thanks can’t wait to try it!! Thanks so much Maria! I hope you do!! It is super fun! The best way to control the size of your stitches is to make sure you are minimizing the size of each loop of yarn you pull any given stitch. You can do this by grabbing the working yarn close to your hand for the next stitch and keeping the amount of yarn pulled through for the next stitch to a minimum (though you should still be able to move your hands). You can also tighten your stitches manually, bringing any excess length into your working yarn. If you do this, make every effort to keep the stitches a consistent size throughout your work. It may be that the yarn you are using isn’t thick enough to create a substantial yarn. Try adding an additional strand and see if that helps. Not sure what to say about the tail except that you can weave it into the end to keep it out of the way if you want. Have you ever tried to make a throw blanket with this method? I’m curious if you think the stitch would be too loose for that. Thanks! Hi Hannah! You can make a throw blanket with that method. I would look at the other comments in this post. I’ve answered this question before. 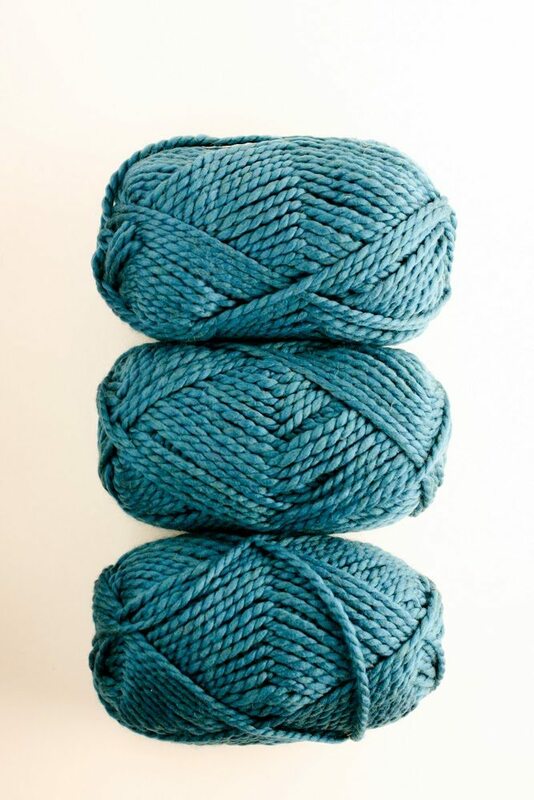 I would consider adding another strand to bulk up the yarn, especially if you are using a slimmer super bulky yarn. This tutorial is awesome! I do have a question though, do you have to use three strands or can you do this with just two strands? I love the scarf I’m just worried about it being so thick around my neck. Hi Meagan, You can do it with two strands, I just find the stitches become to loose for my taste. But its so fast, give it a try. If you don’t like it, add another strand and do it again. . .
Can’t wait to try it . I hope I can do it?????? Hi Mary! You can do it!! have fun. Hello!! Love this tutorial, but I’m having such trouble keeping it tight! Is there another trick to it? Maybe I just need to keep practicing.,? Hi Laura, This is a common difficulty. The best thing to do is to grab your working yarn as closely as possible to the stitch you just made and then keep your hands fairly close together (not so close that you can’t move 🙂 and keep the yarn taut as you make the new stitch. Try to do that and tell me how it goes! Hi Anne! I’m 11 and this arm knitting thing is SERIOUSLY working for me! You make it look so fun and easy, and it IS! You’re really creative! Keep posting more crafts and ideas!!!! I really like them! What a great comment CraftLuver! Thanks so much for making my day! Hi! I am 12, and this is kind of working, but I like crochet better. No offence. Thanks for the how-to pics! What do you do with the stitches i when you are interrupted and have to put your project down? I go over that in the next post, but basically you can take the stitches off your arm and put them on to some sort of holder. I find a old paper towel roll works really well. When you are ready to start again, make sure the knit side is facing you and the working yarn ends up at your hand. Then, just start knitting again!! it may wait till after Christmas but i am definitely going to try it. I’m so glad Beverly!! You certainly should! I just backed up to refresh my memory on casting on. Hi I’m wondering how you got the blue one so tight?! Is it tighter because you used three skiens? Thanks for asking. Yes, making the yarn bulkier goes a long way to making it tighter. If you think about your arm as a needle, the yarn has to be pretty thick to make a full stitch. It’s more expensive, but its workth it! Read through other comments for ways to keep the knitting itself tighter. Hi! you tutorial is AWESOME. and I’m going to use Lion’s Brand Wool Ease Thick and Quick (Wool/Acrylic blend). May I ask how many bunchs of yan will I need for one muffler? I’m asking because I’m an asian in Asia. So I need quite exact amount for international shipping. Thanks so much for your comment! I’m so glad you like the tutorial! If you buy that yarn, you will need 3 skeins of it. Good luck and have fun!! I didn’t see it mentioned above, but I was wondering how long does it take to do one cowl? It’s not the sort of thing you can put down when you have to take a bathroom break since you are the knitting needles. I generally find it takes me about 45 minutes to 1 hour to make the cowl from start to finish. Have fun! I have found this quite a fun tutorial but am using the bulky yarn I have on hand. It appears my yarn strands aren’t long enough but I have multiples of them. Is there a good way to connect more strands to finish the cowl? yes, if you run out of yarn, I like to attach new lengths by using a sliding knot and then trim the ends. Even though this leaves a knot, it is amidst three other lengths of yarn and is hidden pretty well. I provided a link to the knot in the comments above. Have fun! I just knit my first cowl, had a lil error due to a distraction but I think I can fix it. It was really easy. Although it’s really lose, not bad for a first try. Thank you I think I’ll have lots of homemade gifts for Christmas. Congratulations! I’m so excited for you. Each time you do it, it gets faster and easier and tighter . . . . I am vacationing in FL for the month of December. My 15 year old niece and her friend are coming to visit and I figured this would be a way to enjoy a little quiet activity time, but fun and a wonderful introduction to knitting (which I learned from my great grandmother). The I figure the scarf/cowl will be a great trend starter when they return to school. What do you think? Am I taking on too much? Hi Sue,I’m so sorry for my delayed response! I was having problems with my wordpress comments and wasn’t able to respond until now! I think it would be a great way to entertain your niece and her friend! brilliant! It is a good introduction to knitting, for sure! Have fun!! I love this! I’m making them for gifts. My daughter is asking me to make one for her. How many do you think to chain for an 8byr old.? Thanks! I would bring it down to 8 stitches for an 8 year old. You could always shorten it to one loop, also. Enjoy!! Thank you so much for your arm knitting tutorial. This is such a great help to beginners like myself. I love the clear pictures as they are easy to understand and they are much easier for me to follow than a video I have to pause when I get stuck. I like to study the pictures as I am a visual learner. 🙂 Thank you again! I have shared this with all of my friends who want to arm knit! Hi Miranda! Great to hear! I’m so glad you found the tutorial helpful. Thank you so much for this!!! I have watched video upon video to learn this. This is going to be so much help. I can not wait to start my scarf! I’m totalling new to knitting and am interested in Arm knitting. 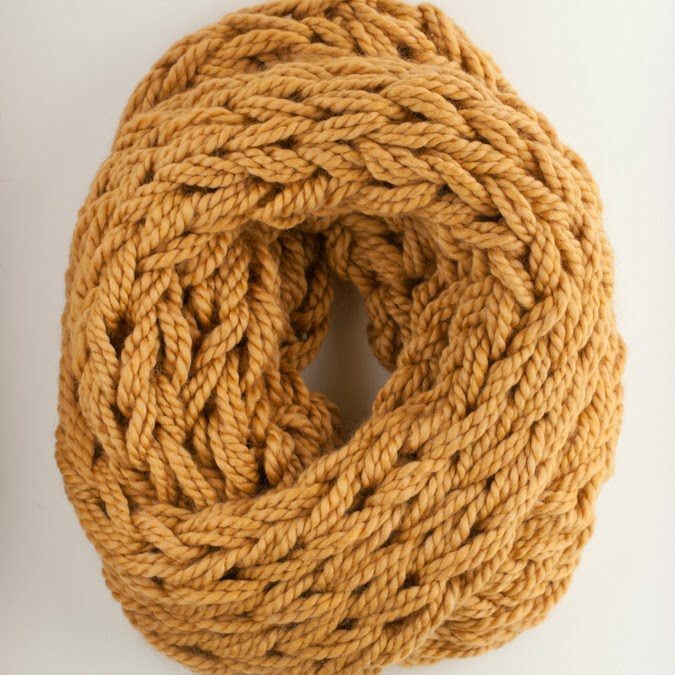 How do I choose the correct yarn for this cowl? The only info I got are such as : Needle Size = 10mm, Ply= Super Chunky, Tension= 9 sts and 12 rows, Yarn Length = 80m. Which part of the info indicates the suitability of the yarn? Also, if the yarn is insufficient in length for completing the scarf, how do I join the new ball of yarn to existing piece of work? HI Jerrica, Hi! I’m so glad you’ve asked. I have a very detailed instructional video on Creativebug (www.creativebug.com) for free if you want to watch that. I talk about yarn selection in detail. You want to choose a Super Chunky yarn, so that’s correct. The part of the tension you’re concerned with is the number of stitches. The 9 stitches you describe above is the number of stitches you would get over 4 inches of traditional knitting – this is equivalent 2.25 stitches to an inch. 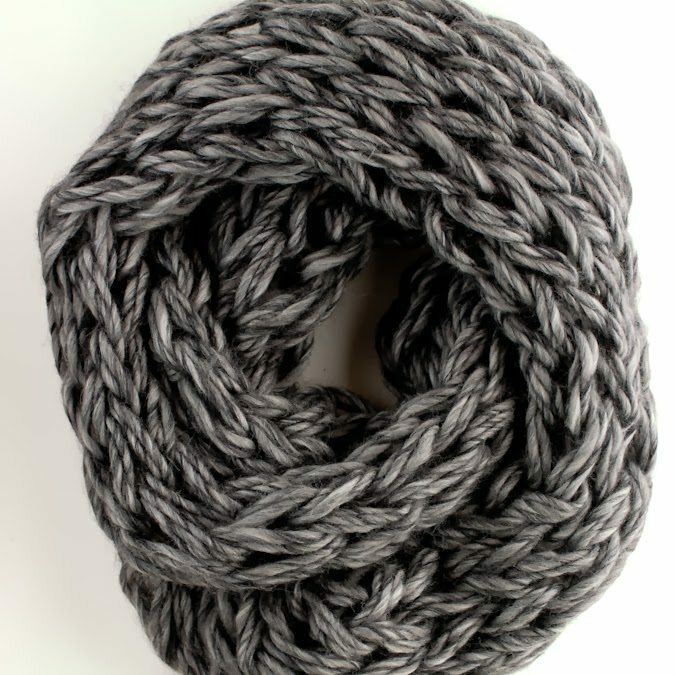 To make a nice arm knit cowl out of three strands of yarn, you want a range of 2.75 stitches to the inch or smaller. The bigger the number of stitches to an inch, the lighter the weight of the yarn. The smaller the number of stitches to an inch, the heavier the yarn. The length for a cowl that wraps around twice, made of 10 stitches across, is about 85 yards. If you are using shorter length yarn, you can just knot the ends together as you come to the end. Because you are using three strands at the same time, a knot in any individual strand doesn’t show that much. I suggest a sliding knot to attach the two ends. Hopefully this helps! Thanks for sharing your great tutorial. Completed my first scarf today! Loved your tutorial! I’m definately going to try this. I also enjoyed the easy to read layout and pictures. I was wondering if you could tell me the name of both fonts used within your first picture (says “Arm Knitting How To” and “part 1: casting on”). Thanks, and hope you have a wonderul new year! Hi April, I can’t remember what the first one is, but the second one is soymilk. Thanks so much for taking the time to leave a comment! Have fun arm knitting!! Its not hard . . .you can do it! I’m so glad you loved my tutorial. I do have a PDF you can travel with. It is for sale in my Etsy shop for $3.50 (https://www.etsy.com/shop/flaxandtwine) I emailed, but got a bounce back. Happy travels and arm knitting! Thanks for this DYS, craft, something new to try. I love to knit and know this will be enjoyable! Looking forward to more tutorials from you. Your welcome Darlene! I hope you love it! HI Lilian, do you mean when the instructions are trying to load? Is there any way to do it with 1 skein of yarn? Hi Priscilla, You can – but I would split the skein up into three equal parts and then knit with the three parts. The knitting doesn’t look very full if you just do it with one skein. If you do split the skein, I would cast on fewer stitches so you get a full cowl. I get this pattern ? ? Definitely! You can do it! It is much easier to pick up that traditional knitting – less to fuss with. I also have book out (right side bar) that provides lots of helpful hints, photos and tricks! Um, no offense or anything but I didnt really quite get your method. I mean, you should add lots of pics instead of words. I know one of you will tell me to watch youtube instead (which is a pretty good choice) but considering the facts that some people cant watch youtube due to weak signal, I came unto this website. I appreciate the crafts and also this website, I just feel that the way you explain isnt satisfying is all. Good job on the knits though! Theyre really cute. No offense taken! I’m so sorry you had trouble with the tutorial. I try to provide lots of photos, and I’m sorry there weren’t enough! Keep an eye out for a class. Sometimes it’s easier to learn in person. Good luck learning how to arm knit!! Thanks so much April! Yes, you can add a stripe! You can change colors at the end of the row. Just start knitting with your new color by leaving a 10″ tail and starting to knit with the new color. Then, cut your old color with a 10″ tail. Tie the two tails together with a knot. Weave the ends in at the end of the blanket – gonna be gorgeous!! i’m enjoying this arm knitting, this is my first attempt. II was wondering how long you make the scarf. Thank you your instructions are perfect. Hi Roberta, Thanks so much! I usually make the scarf about 52″ long and then attach it in the circle. Let me know if you have any questions!